Back in 2002 I dropped a large chunk of change on a pair of "true" 6.1 surround sound headphones. They were essentially a pair of normal headphones with extra speakers extending out to either side of each ear cup. They looked ridiculous. I loved them. After spending three weeks with Razer's Tiamat 7.1, the world's first true 7.1 surround sound headset, I realize what an easy-to-please idiot I was ten years ago. Since my initial foray into surround sound headphones so many years ago, I've kept myself occupied with simulated surround, convincing myself that it was just as good as the real thing. I could live with inconsistent volumes across simulated channels and the occasional dead spot, as long as I could vaguely tell which direction the bullets were coming from. The same goes for PC audio hardware. Onboard all the way, why waste a slot on a fancy sound card when what I've got has all the required inputs and outputs? Those of you used to a richer audio experience are probably ready to strangle me right now. I'm right there with you. The Razer Tiamat 7.1 has shown me the light. Or let me listen to the light from different directions. Something like that. The difference is plain to see the moment you free the Tiamat 7.1 from its extravagant packaging. Windows on the outside of each ear cuff (which can be covered with a pair of opaque plastic pieces) deliver an excellent view of the 10 drivers powering this beast: two of each front, center, side, back, and subwoofer. This arrangement makes for a rather beefy set of headphones, but no more so than your average larger-sized headset. The padded leatherette ear cups are almost too small for my giant-sized noise glands, so they shouldn't be too unwieldy for those tinier than me (i.e. a large percentage of our readers). Available soon at Razer's Online Store. A slight panic gripped me as I unraveled the Tiamat 7.1's braided cord to be met by five audio plugs and a USB cable (for powering the drivers and the signature Razer glowing squid thing). I wasn't certain my PC had that many audio ports. Being a computer manufactured within the past five years it certainly did, but again, that goes to show how little attention I've been paying. So I hooked them up, loaded up some Kingdoms of Amalur: Reckoning (which doesn't expressly support 7.1 surround), and the difference was immediately clear. These ten little drivers we're doing a better job of keeping me surrounded on all sides by crystal-clear audio than anything else I'd plugged into my PC earlier. And once I realized the bass drivers weren't firing and went into my control panel to fix that, they sounded even better. Gone were those pesky dead spots. Volume inconsistencies were handled readily via the bulky-yet-lightweight control module, which features individual volume controls for each of the five channels as well as the retractable built-in mic (which, incidentally, certainly did the job it set out to do). The control even features a pass-through for my PC speakers, so I don't have to keep handing the wife my headset whenever I want to show her YouTube videos of our children. Looking into games that expressly support 7.1 surround sound I was delighted to discover that Left 4 Dead 2 was on that relatively short list. I quickly discovered that sometimes knowing where the zombies are coming from isn't a comforting thing. I found myself jumping at every sound made by the infected, my teammates, and myself. In fact the only thing I wasn't jumping at were the normal sounds of my household—annoying cat, babies in peril, things on fire. The Tiamat 7.1 does a wonderful job of muffling the outside world, something I can't recommend enough at this point in my life. 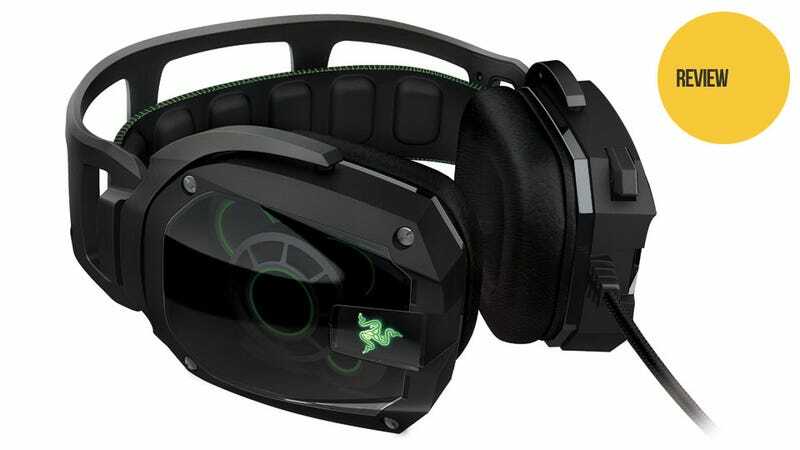 And I can't recommend the Razer Tiamat 7.1 surround sound headset enough either, though keep in mind this is coming from someone that's gone from "okay, that works" to "more sound than I knew existed". The only two major problems with the unit currently is availability: Razer is sold out and struggling to meet overwhelming demand, something that seems to happen quite frequently with their oft-delayed high-end products. Some may also balk at the $179.99 price tag. I'd say this is a case of getting what you paid for. Hell, I'm shopping for sound cards now, convinced more hidden audio treasures are waiting to be uncovered by these inexperienced ears.